Alegra is a very pretty, very bright, very girl hot pink/fuchsia. 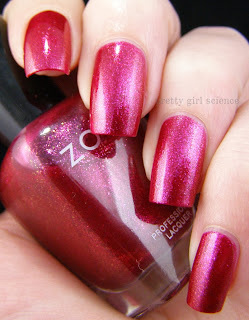 It is packed with shinies, like you would expect from a Zoya polish. The formula is a bit fussy, and I needed three thick coats for opacity. It's a perfectly lovely color, and nice for the holiday season...especially if the traditional reds/greens/blues don't thrill you. But guys, seriously. Check the clearance at your local Ulta. I found this one for $4.99. Not too shabby when you consider the regular price tag at Ulta is $8.00.